We realise that people disagree with the census for a lot of reasons, and may want to take many different types of action to express their discontent. Here are just a few ideas. We do not want to be prescriptive. If you are using a tactic not listed here, please let us know on info@countmeout.me.uk and we may feature your idea on the site. If you agree with the sentiment of non-cooperation but can’t justify the potential repercussions then you don’t have to be passive. You can cooperate with the census and still take part in the campaign against it. Many people will be taking this type of action. Fill out the census, but make your discontent loud, clear, and persuasive: write to your MP, lobby your local councillors, get in touch with your local media, or create a petition. Companies like Lockheed Martin are only able to function by appearing legitimate. Building awareness about the true nature of the arms industry is something anyone can help with, and the outcome can be hugely damaging to the public image of such companies. If it’s a better, more socially useful census you’d like to see in place, then putting political pressure on your representatives can be effective. Count Me Out has a template letter which you can address to your local MP to explain why you are angry. Feel free to use and distribute. Another idea is to fill out “supplementary questions” and send them off with your census. For more information about the legality of actions, see our Legal information page. A boycott is perhaps the strongest signal you can send to the government indicating your objection to the census. Whatever your principal concern with the 2011 census may be, refusing to fill out your form is a powerful action, particularly if accompanied by a letter to the ONS or your MP explaining the reasons for your non-participation. Putting political pressure on your elected representatives does sometimes work. Count Me Out has a template letter to send to your MP outlining one of the main reasons, Lockheed Martin’s involvement, for non-participation. Feel free to use and distribute. Rather than simply tearing up your forms and writing to the authorities to tell them you’ve done so, you can go for a ‘spoilt ballot’ approach. This is the perfect opportunity to make a point outlining your reasons for non-cooperation. Whether you prefer to write a few paragraphs outlining the cause of your grievances, or simply repeat the same sentence again and again, as long as you are clear the political point won’t be lost. This year, for the first time in the history of the UK census, the option exists to complete the form online, and send it off via email. Whilst this technology will have an impact on the number of collectors going door to door, it is still not the principle method of census completion. Most houses will still be issued with a physical form to fill in. This action would be more appropriate to those people taking action because of problems to do with the content, purpose and allocation of questions on the form. 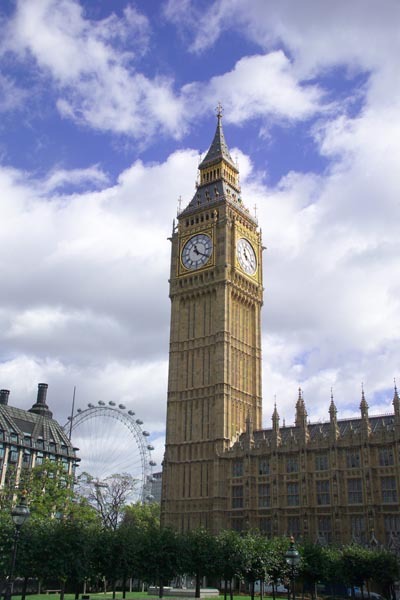 The disproportionate amount of space given over to questions regarding immigration in comparison to those relating to income and disabilities means vital information is not collected that might otherwise highlight a need for more public service provision. If you feel the questions about immigration, for example, are inappropriate and ideologically motivated then leave the section blank –maybe respond to the questions you think should have been asked instead. Getting the word out there is easier than it has ever been with Twitter, Facebook, blogs and email. But that’s no reason not to be old fashioned in your endeavours -not everyone who will be angry about the census will be tweeting and blogging. Aside from online campaigning, why not contact your local radio station and newspaper. Local media are often eager for a story, particularly if there’s something to flesh it out like a petition, a meeting with your local council (or an action against your local council), a direct action, or the establishment of a local group doing a photo stunt. The possibilities are endless. A similar flavour would be to fill in the census, but make the processing of it really difficult. Write the letters upside down! Remove the barcodes! Translate everything into Esperanto! The Peace News blog posted up both a long and short how-to of how to cause Lockheed financial damage in this regard, which is a good read and which includes tips and useful tidbits. There’s a proud tradition of symbolic action involving fake blood and sometimes not-so-fake blood against the authorities. This could easily be extended to the census itself, if you’re not planning on responding online. There should be plenty going on Friday and Saturday (18th-19th March) for you to get involved in, but other than the e-action ‘Let ’em Have It!’ day, the extent to which there are protests is really up to you. When thinking about how to create the biggest media splash possible there’s nothing the press like more than a good action story. Stories based on people just saying something will be less likely to be picked up than those containing a lot of people protesting in a creative way. Lockheed Martin have offices around the country. If you are lucky enough to live near one, why not pay them a visit? Again, you might want to leaflet the staff, local residents, get a petition going in your town centre, form a huge conga line and bang drums –anything to turn people’s heads and get them asking questions. This is a versatile action. Whatever you dislike about the census, you can create your own census form and questions: fill it in with whatever you want to say, whatever you think is appropriate. Count Me Out is hosting an alternative template form you can download, print out, fill in and then send. Find a copy on our Links and resources page. If you wanted to make this a creative action then you could make all your questions fun ones of your own choosing, along with suitably ridiculous answers. If you’re concerned with the ideologically loaded plethora of immigration questions, and the dearth of income related questions, then redress this issue instead. Ask (and answer) the questions they aren’t. This can be a creative way to boycott the census –by sending the form off instead of the real one. If you don’t want to boycott then you could send off the alternative form as well as your completed official form. As well as an enjoyable avoidance tactic, you could throw a house party in the next week, only make it a ‘Census Party’. Getting a number of cool people in a room together and spending five minutes explaining why people are taking action against the census is a good opportunity to spread information, and foster some debate. Collective action is much more likely to succeed (or indeed, to happen) if there are a lot of you doing something together. Have a strong sense of civic duty and a propensity for street theatre? Why not volunteer in David Cameron’s ‘Big Society’ by interviewing neighbours and people in your local community for the Big Society Census. This question is the only one on the form you’re not legally obliged to answer. You may well recall 2001’s census returned more Jedi than Jews in the religion section. The British Humanist Association is calling for people to write ‘no religion’ rather than just leaving it blank (assuming you aren’t religious) this time round. If you don’t want the hassle of a fine or printing out alternative forms, then you could state your religion as “anti-Lockheedian” or something infinitely wittier. 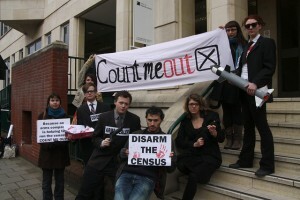 Disclaimer: Count Me Out does not seek to encourage people to break the law in any way or boycott the census, but to raise awareness about the 2011 census and action that people are taking around it. It is a criminal offence under the Census Act 1920 to not complete the census, to not complete any part of the census (other than the Religion question), or provide false information. Taking these actions would leave you liable to prosecution which could lead to a criminal record and a fine up to £1,000.